How Far is Priyanka Life Space? 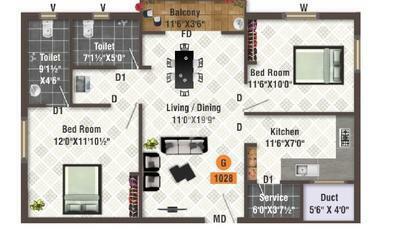 Priyanka Life Space, a residential project located in Chennai, developed by Priya Construction. 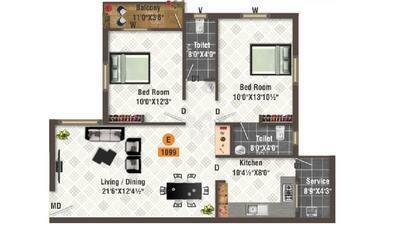 This project offers carefully crafted 2BHK and 3BHK apartments for sale in Maduravoyal. 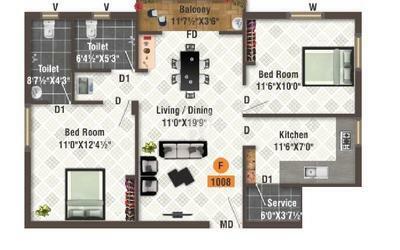 The facilities are carefully placed to make sure the residents have a peaceful living at Priyanka Life Space. 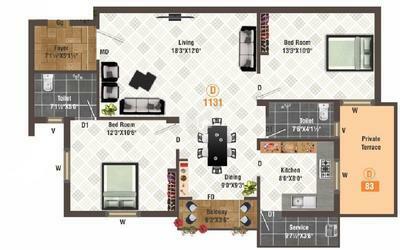 Efficiently developed apartments in Chennai located in Maduravoyal locality and it holds a nominal number of efficient apartments having a load of amenities for its home buyers. This project is located in the western part of Chennai and you can reach Koyambedu from here in just a few minutes which is a major part of Chennai city and an activity center. 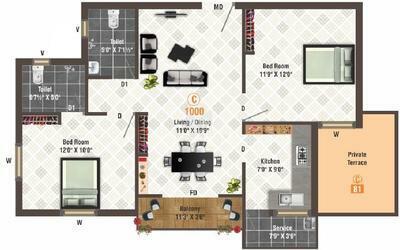 Maduravoyal is bounded by well-known localities like Nerkundram, Mogappair, Vanagaram, Valasaravakkam, Alapakkam, and Porur, in addition to this, the residents of Priyanka Life Space have easy access to public facilities like schools, colleges, hospitals, recreational facilities, shopping areas, and parks. 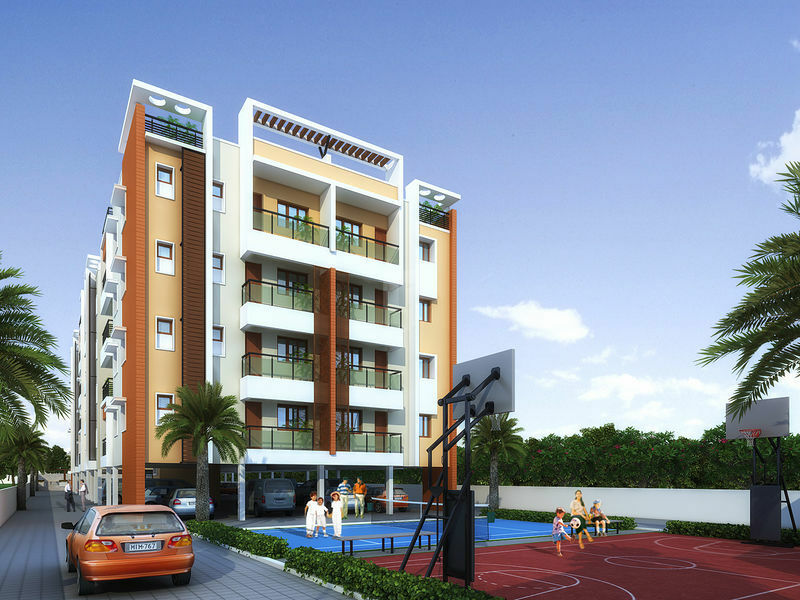 Along with all these advantages and 2, 3BHK apartments in Maduravoyal, Priyanka Life Space offers many trending amenities, some of them are Gym, Tennis Court, Swimming Pool, Clubhouse, Video door Phone, Children's Play Area, Rainwater Harvesting System, Car Parking and Security. 1.Interlocking paving blocks shall be provided in outside area. 2.Compound wall of height 5’ above FFL shall be provided. 3.Security cabins, main gate, ramp and common toilet shall be provided. 1.Entrance grill gate for main door, balcony & service safety gate. 5.3-Phase EB, waste water and corporation water connection. 1.RCC framed structure designed and detailed as per IS: 456-2000. 2.Grade of concrete and grade of steel shall be M20 & Fe415/500 respectively. 3.Isolated footing is considered for foundation system as per soil report. 1.All external and internal brick walls shall be 230mm & 115mm with 1:6cement mortar respectively. 2.Parapet wall shall be 115mm thick and 3’6” high. 3.12mm thick internal and 20mm thick external wall plastering with 1:5cement mortar. 4.Ceiling plastering with 12mm thick using cement mortar 1:5. 1.Water proofing (Tapecrete) of 2mm thickness shall be provided over bare concrete. 2.Brick jelly mixed with lime shall be used for weathering course. Minimum thickness of weathering course is 2” with a slope of 1 in 120 over that pressed tiles will be provided. 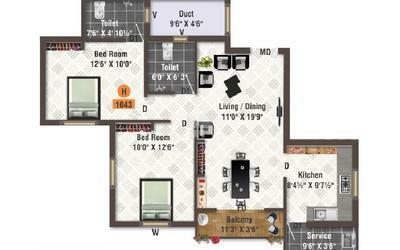 1.Flooring tiles shall be 2’x2’ vitrified tiles except toilets and service areas. 2.12”x18” Glazed tiles for bathroom wall upto 7’ & upto 2’6”above kitchen platform for kitchen walls. 3.12”x12” ceramic tiles for bathroom & service floors. 4.Lobby at all floors, steps & kitchen platform shall be placed with granite. 5.Car parking shall be finished with RCC Flooring with VDF & Paver block. 1.Main doors & door frames shall be bhurma teak wood solid door as per architectural design. 2.Teak wood frames and designed door for bed rooms and kitchen as per architectural design. 3.Teak wood frames and water proof doors shall be provided for balcony, service and toilets. 4.Joineries for main door shall be brass with one godrej lock. 5.Joineries for bed room door shall be stainless steel. 6.Joineries for balcony, toilet and services door shall be aluminum. 7.Lock with handle will be provided for bed room doors. 1.UPVC windows are all openable/sliding shutters with fixed grill. 2.UPVC ventilator shall be fixed louvers type as per design. 3.Teak wood French windows shall be openable as per architectural design. 4.Joineries for all windows shall be stainless steel and lock will not be provided. 1.CPVC pipes & fitting shall be used for concealed water line. 2.PVC pipes & Fitting Shall be used for external water line, drainage and soil pipes. 3.Sanitary fittings such as closet, washbasin & sink are parry ware or equivalent. 4.CP Fitting such as taps, wall mixer, sink mixer, showers etc., are Jaguar fittings or equivalent. 5. 2 Nos. 8” diameter bore well provided. 1.Kundan or equivalent wires shall be used. 2.Anchor Roma or equivalent switches shall be used. 3.Concealed electrical wiring in all areas. 4.Wiring for generator power backup shall be provided. b.1 coat primer over putty. 2.MS grills shall be painted with Black colour enamel 2 coats. 3.Doors shall be painted with (ivory) enamel painting 2 coats. 4.Main doors shall be varnish finishing. b.Two coats colour work for all walls (Exterior Emulsion (Asian make) and Asian mat or equivalent). 1.Stainless steel handrail shall be provided for Staircase. 2.Capacity of the sump will be 30000litres. 3.2Nos. 6 passenger lift (Cooper Elevators India Pvt. Ltd. or equivalent) will be provided.